From March 29 through May 25, Lêna Bùi’s ’07 mixed media art exhibit, “Proliferation,” will be on display at the Mansfield Freeman Center. 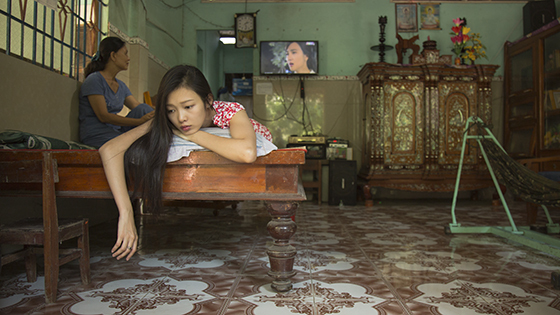 Comprised of photography, painting, and film Bùi’s work raises questions about what “development” means for her home country of Vietnam. The show confronts humans’ relationship with nature, and our uncanny desire to act as colonizers of the earth. Perhaps beyond this, the exhibit is a personal response to a changing world as seen through Bùi’s eyes. “Proliferation” comprises three distinct pieces: photographs of food, an abstract painting in conjunction with images of Vietnam, and a film. The food photographs are taken from a market in Vietnam: They display fake meat arranged to mirror actual animal parts, and are somehow aesthetically pleasing and disturbing at once. In a gallery placard, Bùi writes that this is a reflection on how much we eat with our eyes. Beyond this, the photographs work in contrast with the way meat is usually sold in supermarkets: with its animal origins processed and filtered out of its display. The abstract painting, “myopia,” is a response to the loss of 143 Khaya Senegalensis trees planted since the 1860s. The trees, which once stood on one of the oldest roads in Saigon, were chopped down in favor of expanding a road. Because Vietnam is a country with a one-party system, politicians can effectually make policy decisions that go unchecked. As a result, many Vietnamese citizens have grown disillusioned with politics, believing that they cannot enact any real change. The removal of the trees exemplifies this political disinvestment in Vietnam. The painting is an expression of mourning, featuring rubbings of the stumps, akin to grave rubbings that people make when visiting the headstone of a loved one. The rubbings preserve not the archive that exists in the trees’ rings, but rather the violent cut of a human-held chainsaw. Photos adjacent to the painting portray Saigon’s cityscape as if they comprise DNA strips, suggesting that they depict an image of the relationship between the city’s present and future. According to Bùi, who corresponded with The Argus via email, these photographs exist to provide context, and show a present that shadows the future. The film portion of the show first began as a project with the Oxford University Clinical Research Unit in Vietnam, as a form of public engagement. With Bùi’s interest in the countryside as well as the food industry, she proposed a project that would be centered on farmers in the Mekong. The film spans 47 minutes, although the piece can be viewed in small units as well. There is something inherently voyeuristic about its cinematic style, the gaze of the camera entrenched in its place, refusing to turn its head. The photography, painting, and film portions of the show come together to form a complex story about global development and human-led catastrophe. 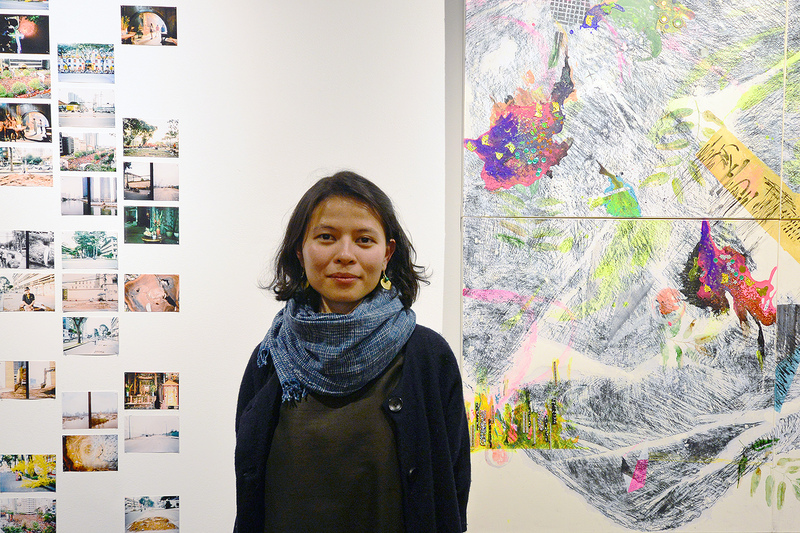 For Bùi, making art is rather like constructing a language. The language Bùi has created reads almost like a personal history. Her work is art in reaction to the history of her parents, her grandparents, her neighborhood, her city, the trees she passed every day, and even the furniture in her house. Standing at the center of the small space and staring at the displays around the room, there’s a wistfulness that jumps from the empty wall space. “Because I live in a place that changes so quickly, and rather haphazardly, I’m constantly plagued with fear of amnesia and of losing the past,” said Bùi. “Proliferation,” therefore, is an artist’s attempt to stop moving so quickly, to allow the ache to set in, because only then can true reflection occur.